Can moms be an expert on boys’ toys, or should dad take charge instead? I don’t know about you, but I want to be a cool mom. I love giving my child gifts, and I don’t want to be left out of the shopping trips at Christmas and on birthdays. But I want the gifts to be beneficial as well as fun. So how do you ensure your boy’s mind is stimulated? How do you give them a fulfilling play experience? Here’s all you ought to know about choosing toys for the 4-year-old in your life. Use the links above to check the latest prices or read our in-depth 4 year old toy reviews below. If you want to ensure you are buying toys your boy will understand, enjoy, and benefit from, there are a few considerations. Think of it as you would age restrictions on movies. Some things aren’t meant for kids because they are not emotionally or intellectually developed enough to process certain topics. It’s much the same with toys. Toys are meant to stimulate a child’s development, so it’s quite important they are suitable for your child’s age range. It’s not to say that all kids progress at the same rate. Only you can determine what’s acceptable for your child. These describe the expected capabilities of a growing child and are categorized by age (source). Physical: Hop, balance on one leg, walk up and down stairs, kick, throw and catch a ball, walk backward. Communication: Understand simple grammar, speak in sentences of five or more words, communicate coherently, tell stories. Fine motor: Use scissors, copy letters and shapes, draw a person with at least two body parts. Cognitive: Identify colors, understand counting, and identify even a few numbers, have a linear point of view, and follow three-part instructions. Emotional: Want to try new things, play with other children, pretend to be parents, negotiate, have a sense of independence and identity. Generally speaking, toys that fit into the milestones above will be suitable for your son. You don’t want to give him anything too challenging, physically or intellectually. At the same time, something too simple may bore him quickly. Hands-on toys: Like Play-Doh, puzzles, puppets, building blocks, and car or train sets. 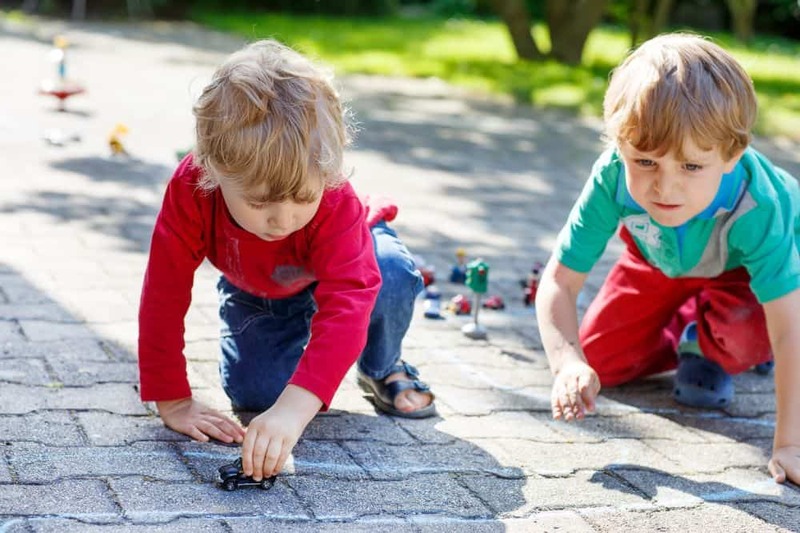 Simple board games: Although 4-year-olds are capable of playing nice, they haven’t quite learned strategy or playing by rules. Simple games are a great way to teach them cooperation and taking turns. Creative toys: Basic art supplies and kid’s musical instruments are suitable for 4-year-olds. They’ll also develop their fine motor skills and confidence. Ride-on toys: These are always exciting, especially for boys. Just be sure that you’ve taken acceptable safety precautions, like ensuring supervision and protective gear. Fantasy toys: These don’t only include costumes. Anything that sparks your child’s imagination (like figurines or props) will do. Adventure, outdoor or athletic toys: Boys this age have loads of energy, so anything that keeps them active is great. If sports aren’t their thing, toys that allow them to explore will also be a hit. Society is becoming more open-minded and less stereotyped. There are even active campaigns to remove gendered toys from shelves (source). I say to leave sexuality and “gender fluidity” out of the equation for now. All they care about is having fun. If all the boys are playing with robots, just let yours experience the hype. It’s the simplest solution for now. Now that you know what to look out for, the fun begins. If all else fails, ask your son which toys he likes. I’ve narrowed it down for you, and here are my favorites. 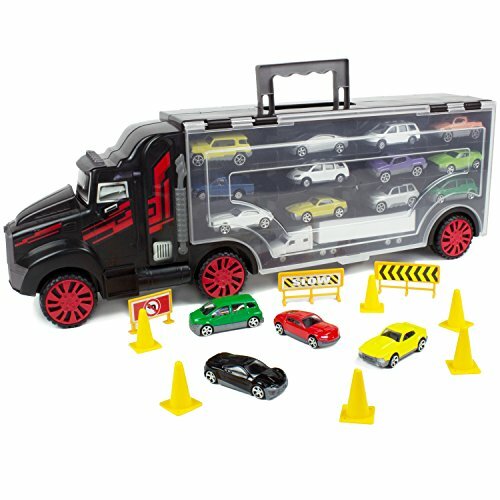 If your boy is in his motor phase, where anything from garbage trucks to sports cars suits his fancy, this 22-piece toy set will catch your eye. It includes a big rig, 13 small multi-colored vehicles, and model traffic accessories. The rig has a handle for easy portability, and each car fits snugly inside, making stowing this toy set a breeze. What’s cool is that it’s not designed to fit only Boley toys. Other brands, like Hot Wheels, will fit inside too. This toy set is 100 percent non-toxic and lead-free, and there’s also a satisfaction guarantee. Transformers is one of those things that just never goes out of fashion. Dads will probably love this one, thanks to its nostalgia. Little ones enjoy Transformers just as much as we do. 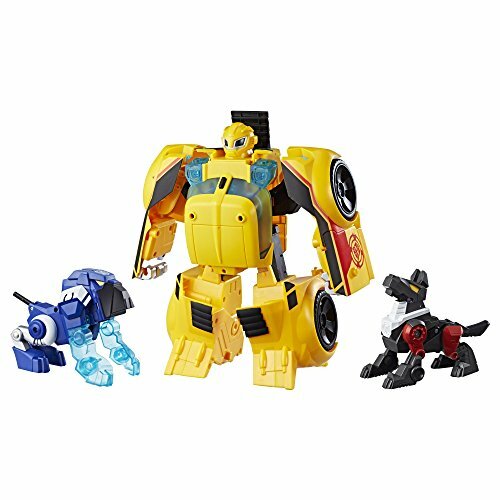 This 10-inch Bumblebee transforms between his robot, megabot, and vehicle form. He also comes with two convertible pets, that can attach to him in either mode. It’s like having three different toys. To top it off, lights and sounds are included to take it up a notch. Your 4-year-old will be roughhousing Transformer-style in no time. Your boy is now at the age where learning starts to take off, so educational play is important. This toy set is such a great idea. It’s simple, effective, and promises to combine learning and fun with ease. 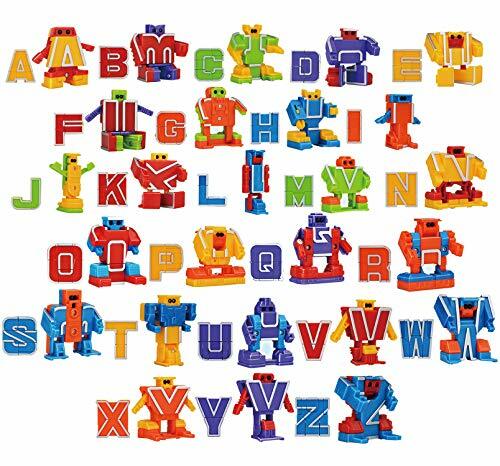 This STEM toy set includes all 26 letters that each transform into a different robot. If that’s not enough for you, the Alphabots can be combined to create three even bigger, cooler robots. This toy has gone above and beyond promoting learning through play, and with a little creativity, education can go a long way. All boys love Batman, right? I don’t think you can go wrong with this one. To start with, this gigantic toy (over 2 feet tall) will get your boy excited. It includes a little Batman character, a Batcycle, and the Batbot. The Batbot comes in two modes — normal and battle mode. In the latter, the bot’s wings and fists are extended and your boy can handle it. He can also be its voice with the cool built-in voice changer. Perhaps its most impressive feature is the 3-foot wingspan. It even fires projectiles and has an elevator for the Batman figure. 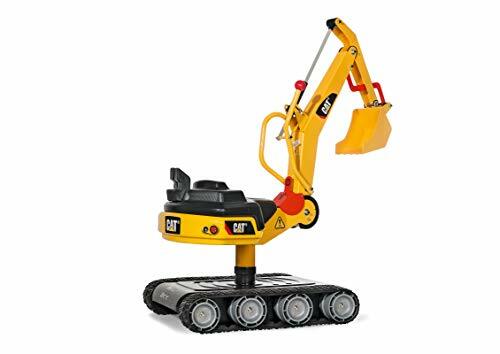 Another one for boys who are endlessly fascinated by motors, they’ll love this CAT digger. Ride-ons are great for the imagination, and they develop your child’s sense of spatial reasoning and coordination. This toy offers much entertainment value. It comes with a functional and realistic dual-action lever and a scooping bucket. The metal shovel is fully rotational. Its wheels are designed with extra grip for safety, and this life-like toy can be used to dig up dirt, sand, and even snow. The only thing better than a dinosaur is a robotic dinosaur. This toy might not be the shiniest, most sophisticated robot out there, but it wins in its simplicity. 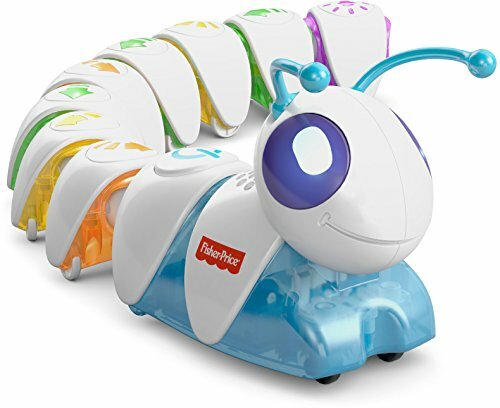 Your 4-year-old will be highly entertained with the LED lights that light up its scales, eyes, and mouth, in red, blue, and green. It also roars (as dinosaurs should), and is easily toggled on and off. This toy stands at 6 inches in height and 12 inches in length, and its batteries are included, which is always a bonus. 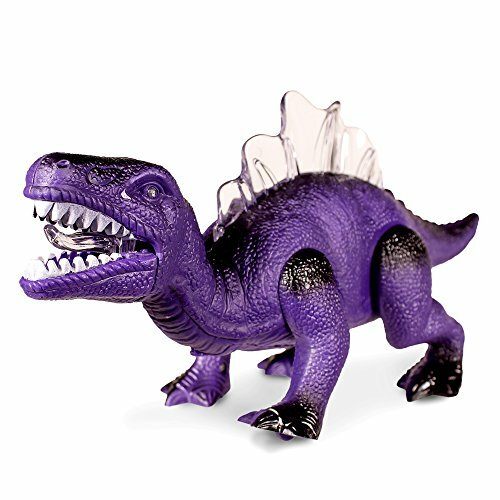 Speaking of dinosaurs, if your son is a fan, he might just adore these colorful dinosaur stamps. 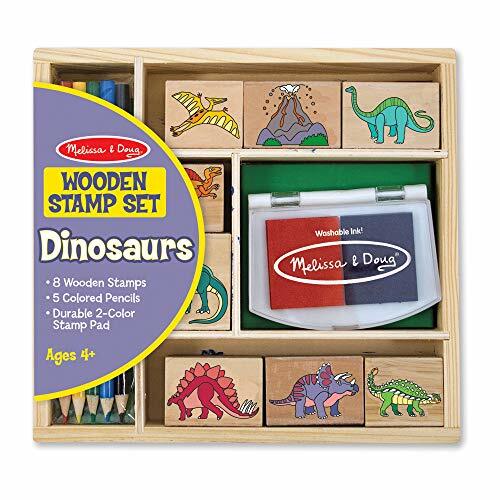 This art set includes eight different dinosaur stamps, two ink pads (red and blue), and five colored pencils. It’s a sure way to promote your boy’s creativity. What’s even better is that stamps like these also encourage fine-motor development. The ink is washable, so you don’t have to worry about the mess, and everything in the set fits into a handy storage box. Coding toys for young boys can be quite a challenge to find, but this could be a fantastic start. Connect this little guy’s segments to control the direction he moves in. The aim is to get him from start to finish. It’s an excellent way to develop your boy’s problem-solving ability — it also helps that some building is involved. The Code-a-Pillar has a motorized head and eight segments that are easy to attach and dismantle. 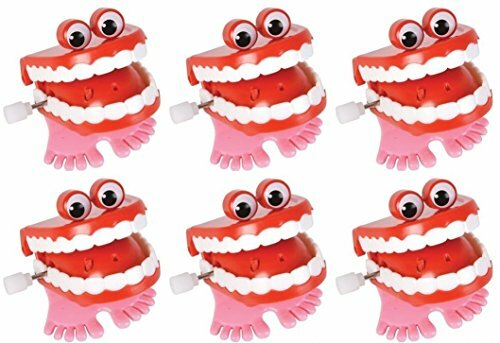 It also lights up, has built-in sounds and blinking eyes — it’s quite the interactive toy. STEM toys are great for both boys and girls. They are fun as well as educational. This STEM toy not only encourages critical thinking, but it also assists with spelling and vocabulary, and imagination too. 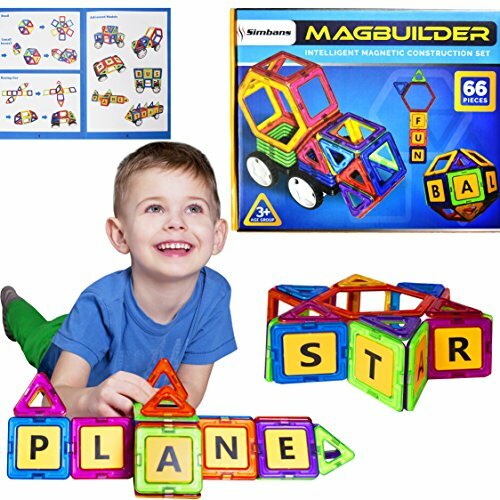 This set contains 66 magnetic building pieces of varying shapes and 26 plastic letter cards. It’s colorful, fun, and magnets are always fascinating to experiment with. You’ll probably have as much fun with this as your boy will. Who’d have thought cardboard toys would sell so well in this modern age? You’d be surprised at how innovative this simple idea is. It’s such a fun way to get your 4-year-old to play actively. There’s not much to it. These are giant cardboard blocks that can be used to build whatever your son’s heart desires. The set contains 40 colorful corrugated cardboard blocks of three varying sizes. This product has a 100 percent quality guarantee. I’m pretty sure I don’t have to explain the developmental value of these toys. In case you didn’t know, blocks like these develop fine motor skills, cognitive ability, and imagination. Typically, people lean toward Lego (see below) but these blocks are another classic option. 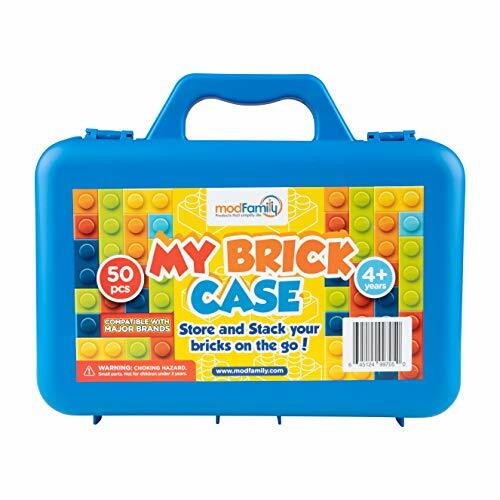 The set includes 50 multi-colored bricks and a convenient carry case that can lie flat and be used as a base. My favorite pro about this is that it’s an affordable option compared to better-known brands. You didn’t actually think I’d exclude Lego from this list, did you? Lego is legendary and with good reason. While you can save money buying alternative brands to their bricks, their play sets are one-of-a-kind and are well worth the investment. 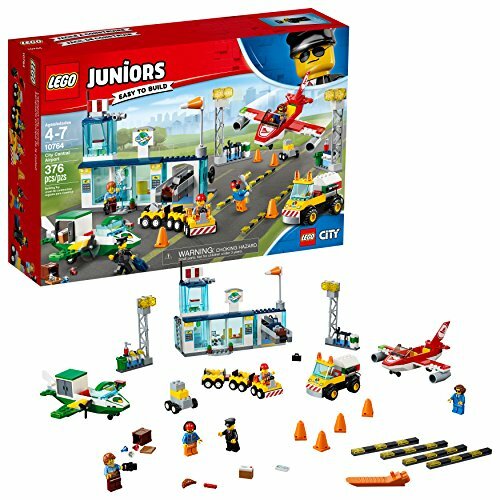 This airport toy set is sure to captivate your little boy. It has a lot of detail and will keep them busy for ages. The set includes a functional conveyor belt, two planes, five character figurines, and a total of 376 pieces. One more Lego and then I’ll stop, I promise. I couldn’t resist adding this Star Wars Starfighter. Boys — regardless of whether they’re fans of the brand — will have a great time with this. 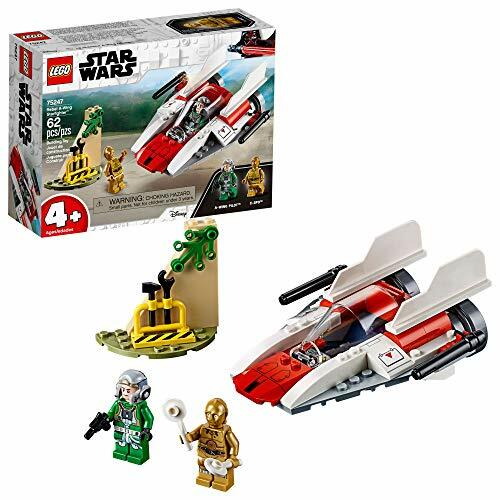 It comes with 62 pieces and includes two characters — a pilot and the beloved C-3PO. 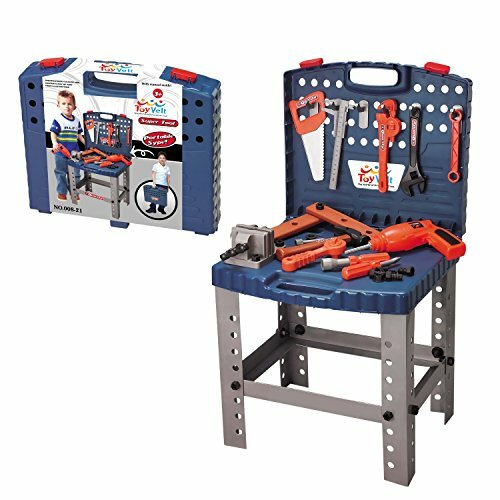 This set also includes an instructional guide to help you better understand the importance of toys like this, and the steps you can take to give your son the best experience. It’s age-appropriate for 4-year-old boys, but grown-ups can have fun with it too. This makes a great gift for little geeks (and Dad too). These are great for imaginative play. 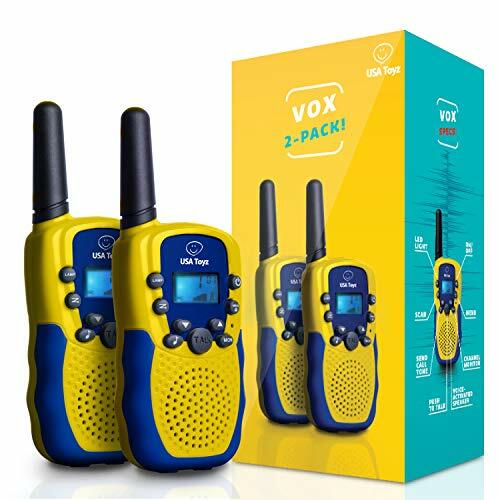 Using these walkie talkies, you can pretend to be cops, spies, pilots, Formula One drivers, and a whole lot more. These walkie talkies look like simple toys, but their coverage can span two miles. They also have a built-in LED flashlight for nighttime adventures and an earphone jack for when your boy needs more stealth. These walkie talkies are voice activated too. They could be fun for the whole family and have a full-quality guarantee. I know I said I’d stick more to the traditional gendered toys, but I quite like the idea of a boyish doll for a boy to play with. Much as we’d like to deny it, dolls are still seen as girly, but this one could break that norm. 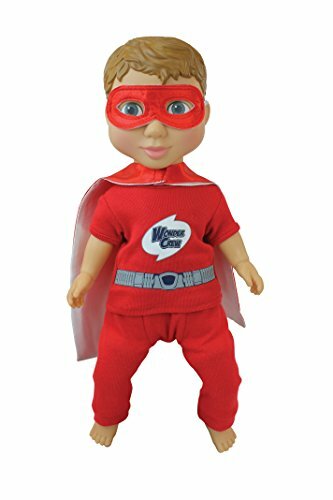 The Superhero Buddy is described as a cross between an action figure and a stuffed doll, to develop your child’s imagination and emotional capacity. 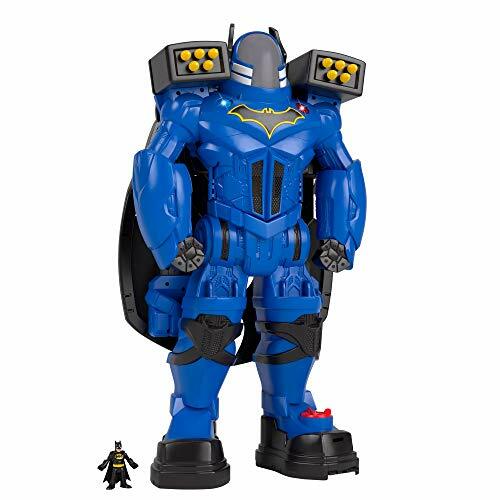 He’s a 15-inch vinyl doll and comes with a matching cape and mask for your son. This toy won the TOTY “Doll of the Year” title in 2018. If you prefer a more traditional “doll” for your son, a classic action figure is the way to go. 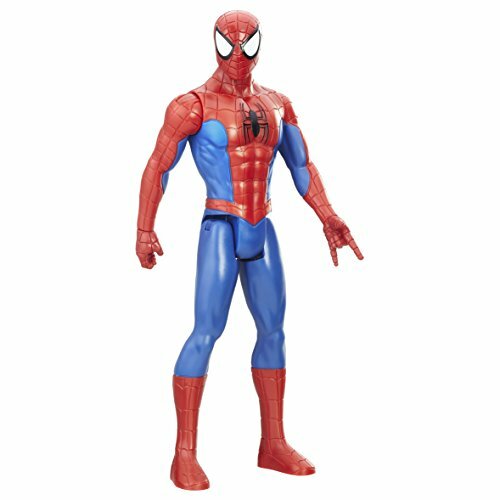 Everyone likes Spider-Man, and boys will love this model of him. He stands 12 inches tall and has movable ball joints in his arms and legs. If you’re willing to splurge a little extra on the FX expansion pack, he’ll even say a few heroic words. This is just one in a series of collectibles, so if your son is a Marvel fan, this is a good place to start. Admit it. Adults dream of bounce houses in the backyard just as much as kids do. They’re colorful, exciting, and get your blood pumping. What a fun way to keep your child active. This model takes up a bit of room, but if you have the space, consider it. It has mesh walls to keep your little one safe and is made from puncture-resistant material. It’s anchored to keep it sturdy. The package includes the bounce house, heavy-duty blower, repair kit, and storage bag. It can hold up to 250 pounds. If basketball isn’t your 4-year-old’s thing, why not settle for some good ol’ soccer? Like many other toys on this list, I find that a soccer ball is underrated. 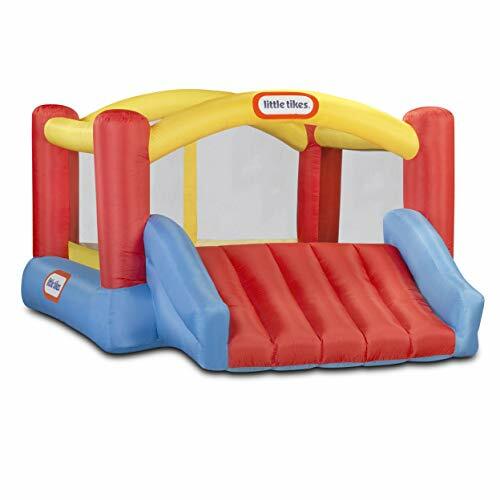 It keeps kids fit and develops their coordination and motor skills, among other things. This set has everything you need for outdoor play. It’s colorful and easy to set up or disassemble, and the height of the net can be adjusted. 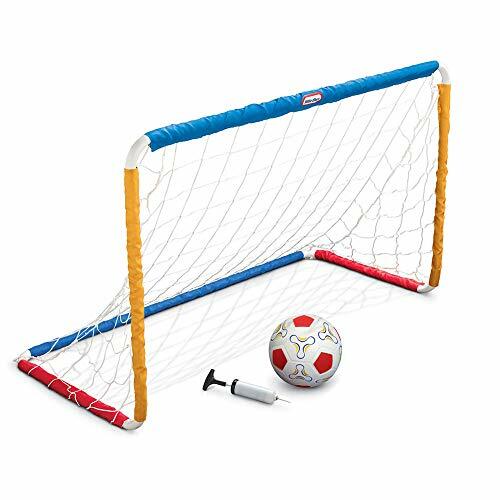 It includes the goalpost, one ball, and a pump. I’m impressed by this toy set. It’s fantastic for imaginative play and works on your child’s concentration and cognitive abilities. It’s a STEM toy that will give them an early start in being a genius. The size of the set is what surprised me. It contains a whopping 68 realistic and functional pieces. It includes an array of nuts and screws, a hammer, a saw, and an electronic drill. Even better, the batteries for the drill are included. This workbench and all its pieces fit into a carrying case. Your little worker will be on the go in no time. Instructions are included. All boys love toolboxes, right? Now you can keep your little one away from dad’s, by getting him his own adorable set. 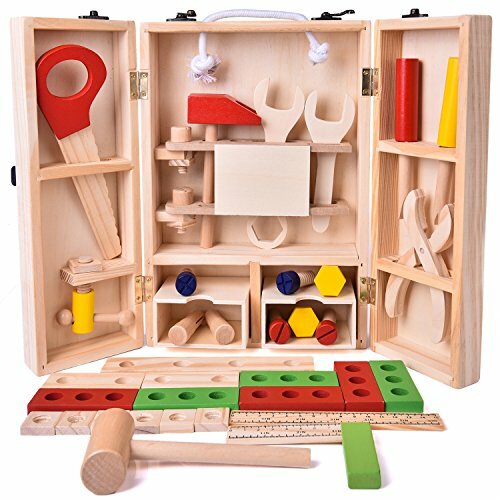 This set contains 43 wooden tools including a hammer, wrench, screwdriver, saw, nuts and bolts, and even a sweet little ruler. They all come in a handy wooden storage box, to save you space when it comes to clean up time. Each piece is made from durable basswood and pine and is deemed safe for kids. In this modern age, wooden toys have become vastly underrated, so here’s another one. 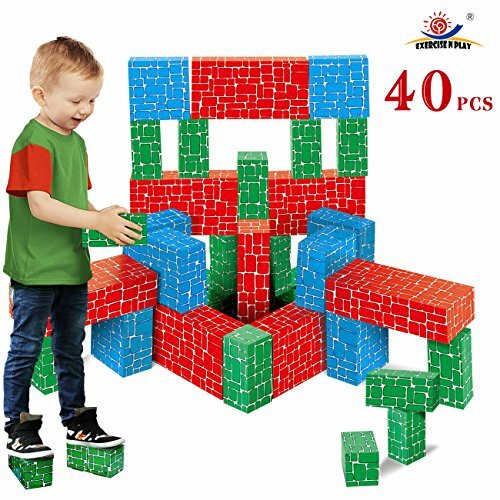 This set has 100 pieces, in four different colors and with nine different shapes. The blocks are durable but light, and safe for kids to play with. 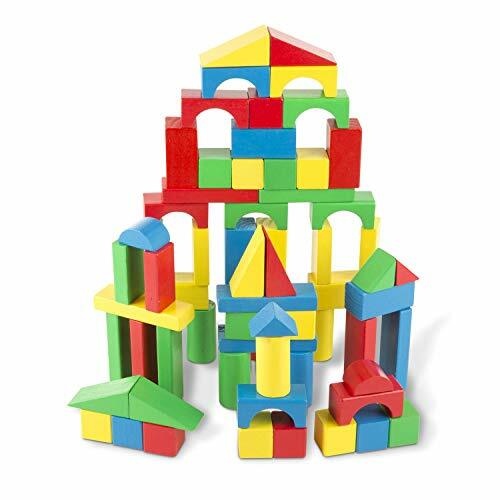 Building with these blocks can inspire imagination, and develop coordination and motor skills. It also comes with a 100 percent quality guarantee. Melissa & Doug is a well-reputed brand for a reason — you probably won’t regret this option. Hear me out,music is important to kids, so if you can say goodbye to peace and quiet just for a short while, this is an excellent developmental choice. It plays on their motor skills, rhythm, and confidence. 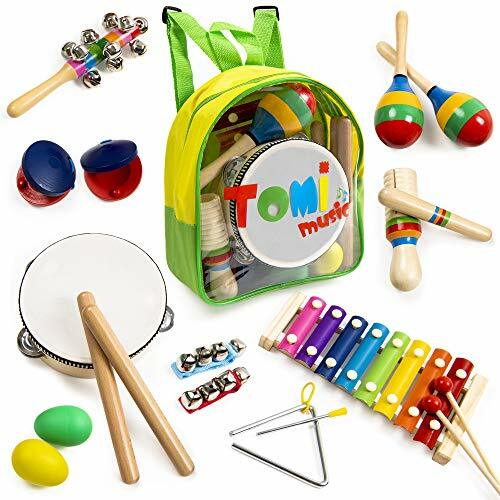 The set includes, but is not limited to, a xylophone, maracas, shakers, a tambourine, a drum, and more. It has 18 pieces in total — so your boy won’t get bored easily. It also includes a backpack that everything fits into snugly. Why not start a family band while you’re at it? My friend’s boy has a tent that he loves with his whole heart. I get the feeling that when he crawls inside it, it’s like he has entered a whole new world. Tents like this one are excellent tools for allowing them to play freely. The design of this tent is wonderful and will catch your 4-year-old’s attention. 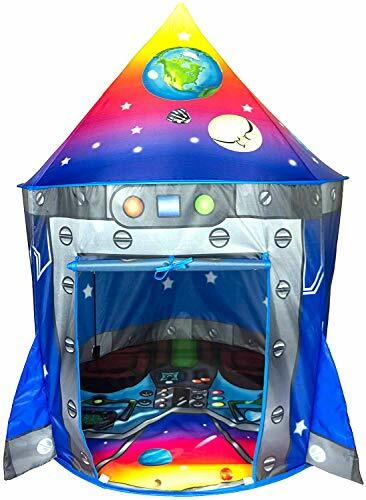 If your son is going through his outer-space phase, this tent will be a big hit. It’s easy to set up, is waterproof and can fit up to three kids at a time. There is also a full satisfaction guarantee. They’re so simple and ridiculous, but funny at the same time. There’s not much to them — wind them up and watch them chatter away while they do a funny dance. These things are pointless, but I have seen with my own eyes how entertaining they are for little boys. A bonus here is that they’re super affordable. If you’re working on a budget, this 12 pack will go a long way, and they’re great for party favors as well. I love the idea of this toy set. 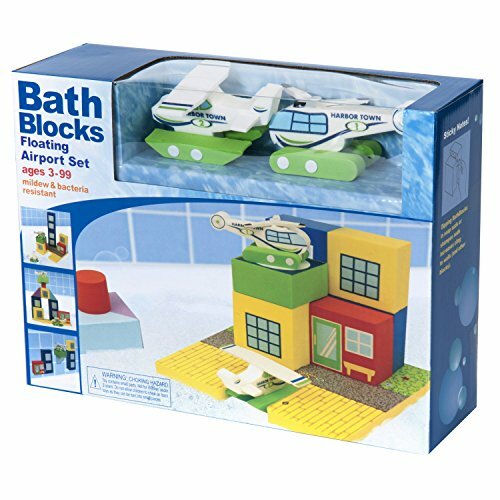 It adds a whole new level to bath-time play while being innovative and creative. Foam building blocks are taken to the next level here with these floatable little guys. As if seeing this airport float wasn’t fun enough, you can design it any way you like. The blocks will even stick to walls when they’re wet. Your son can learn more about geometry, patterns, and cause and effect. Furthermore, they are resistant to mold and mildew, important for bath toys. With so many cool toys, your 4-year-old boy is spoiled with all the choices. Whether you’re looking to boost his confidence or coordination, you’re sure to find a toy on this list to fit the bill. As much as I’d love to pick each of these as a favorite, I have to settle on the Boley mighty truck carrier. It serves as a lesson that we don’t always have to go all out for the best toy — sometimes less really is more. The fact that it can be easily transported is a plus in my books, and that the carrier is compatible with other car brands. Which toys stood out to you? Does your son already have a favorite? Share with us in the comments below, we’d be delighted to hear from you. And please don’t forget to share this article!